Holiday fun runs are the best. Maybe it’s a Turkey Trot after the turkey goes into the oven, or Reindeer Run post-present unwrapping? These morning-of rituals are the perfect way to start the day and a great excuse for an extra glass of Butter! 1. Assemble Your Squad: if you can’t get the family out of bed in time to join, don’t sweat it. Put out a group text and entice the girls to join with the promise of post-run shenanigans! Team colors? we love these Butter-yellow Adidas! 2. I Signed Up… Now What? Girl, you gotta get ready. Most of these holiday runs come in 5k and 10k variations—totally achievable with a few weeks of training, plus extra post-workout vino. We love this three-week training plan to get us from the couch to the course. 3. What Do I Wear?! Have fun with a playful costume, especially if you’re running as a group! Check out these 20 Awesome race-day costumes for a little inspiration. If you’re not up for dressing like a turkey or pilgrim, consider a Butter yellow tutu! After all, it is called a fun run. 4. Tunes. The right track keeps us going to the finish line and the promise of a post run glass of Butter (well, that and the post-run celebration. Check out this ready-made playlist to JaM to while you run. 5. Where’s My Wine? Celebrate the gold around your neck with a little gold in your glass! Grab Butter from the store pre-race, along with a couple of GoVinos for post-run tailgating. 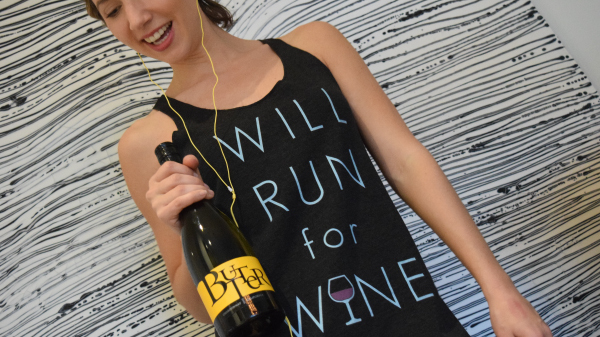 Or text the hubby post-run to pop that bottle and have a ToastMosa ready when you get home, You deserve it! JaMFans. We feel the love—whether you’ve just discovered Butter and JaM this year, or been with us from the beginning, we’re grateful for YOU! 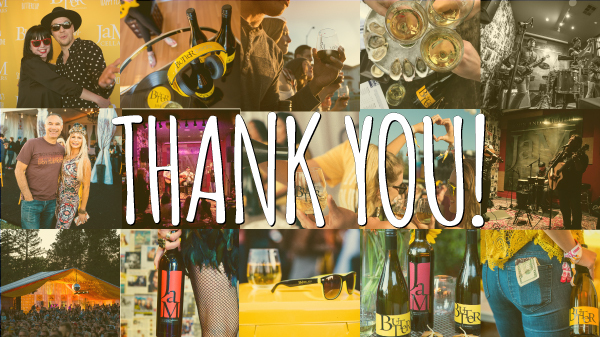 Your ButterLove has made us one of the fastest-growing wine brands of our time. Special shout-outs go to Patrick, Maria, and Chriss...and of course, Pat (Pat, we love that you’d rather “drink 7-Up than any other white wine when Butter’s not available!”). JaMSessions. Music and wine feeds our souls and in 2017 we added more JaMSessions at our wine and music studio in Napa than ever before. 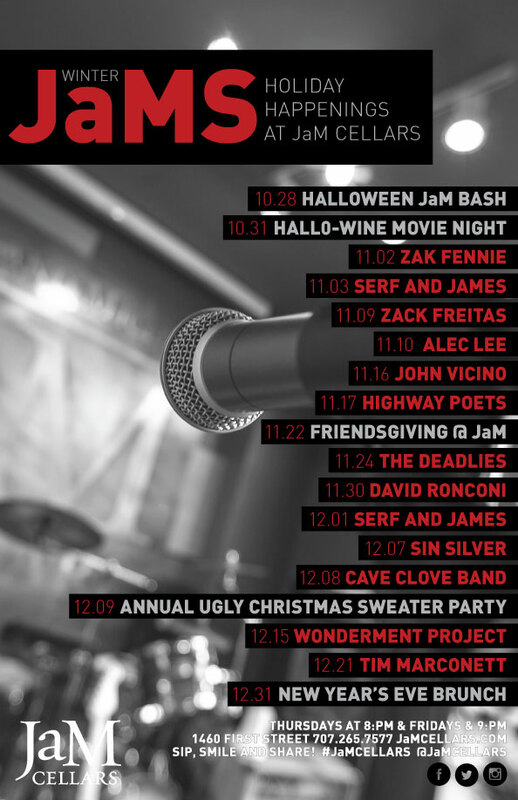 Thank you to all the fabulous artists and bands who’ve played JaM Cellars this past year! A special thank you goes out to Serf & James, Chris Pierce, Alec Lee, High Noon and many more for coming back to see us so often. Check out the line up for the Holidays. BottleRock-ed in 2017. Our friends at the festival worked hard to make it the best yet (you know who you are!). Jayn and the Alice team hosted and chatted up a storm with Gnash, Judah and the Lion, The Heydaze, Gavin Degraw, and Michael Franti, to name a few. And you made it all possible for us to have a rocking festival with lots of smiles. Let’s do it all again in 2018! New JaMClub Benefits. We're stoked about the new benefits of being a JaM Club Member, besides just having wine show up on your doorstep with ZERO effort! Everyone now gets 10% all bottle purchases, ALL THE TIME! In addition, we're giving you 25% off by the glass when you JaM with us in Napa, and priority access to events, releases, music and so much more! Oh by the way... wanna have a party at JaM? It's on us! Just ask how. Big Butter. This August, we finally put lots of extra Butter into one convenient package. Our glorious 1.5L bottles are perfect for parties and sometimes awkward family gatherings, in case you might have any of those coming up soon? Find them here. JaM Cellars Ballroom. The rise of the “ballroom” as a hip music venue found it’s way to Napa, taking over the Napa Valley Opera House. We’re honored to lend our name to the space and excited to see TRAIN perform a benefit concert there in a couple weeks. Check out listings here. First Responders and Wine Country Community. Words cannot express how we feel about our home here in Napa. In the midst of devastation, our hearts were full as we came together during the historic wildfire crisis. And now we’re seeing wine lovers everywhere coming back to the Valley, enjoying the wine, beauty, and hospitality we are so well known for. We are #NapaStrong and we’re open for business. Come up and see us soon. Looking for the festive spirit? Come JaM with us in Napa! Holiday Movie Nights - ongoing through the holidays. We start in November with Home for the Holidays, and nothing can stop us until the tree comes down! On the MUST list: National Lampoon’s Christmas Vacation, A Christmas Story, Bad Santa, and The Ref. But we also love the modern classics... Home Alone, Elf, Love Actually, Christmas with the Kranks, and Scrooged. 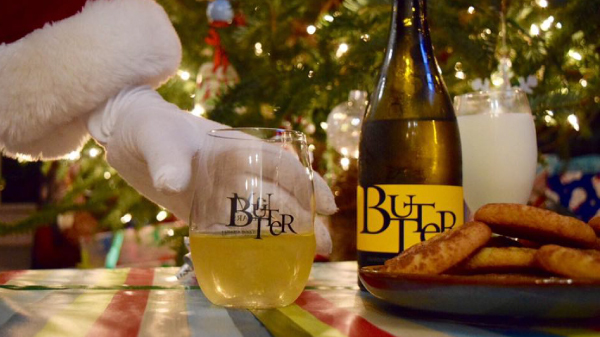 Now, all we need is peppermint popcorn, a cozy blanket, and our favorite Santa mug, full of Butter of course. Friendsgiving - November 22nd. We’re hosting Friendsgiving, and you’re all invited. Come and join us and give thanks, JaM Cellars-style: music, prizes, classic Thanksgiving nibbles, plenty of Butter and JaM and of course a Toast or three. The person who brings the most friends wins wine pairings with their bites! Ugly Christmas Sweater Party - December 9th. At last, your excuse to break that awful thing from out from the back of your closet. The best/worst sweater wins a full-size replica of the leg lamp from A Christmas Story, so dress to impress. 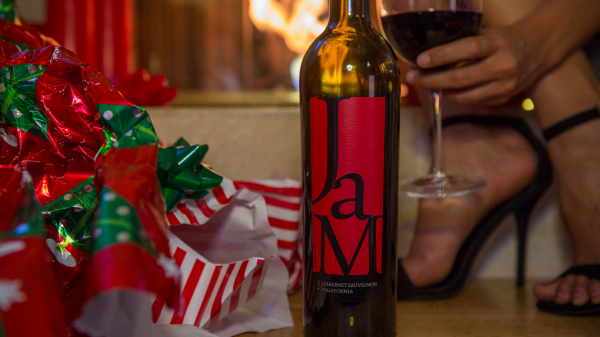 There’ll also be JaM Cellars gift certificates, tastings and pairings, and holiday gift packs up for grabs. NYE Brunch - December 31st. The last day of 2017 is a Sunday, and we need Brunch! and we do have the best wines for this very occasion. Do you want a little JaM with your Toast and Butter? Bottomless Toastmosas, a shortlist of brunch classics, and plenty of great raffle prizes. The best or worst New Year’s resolution will also win complimentary event space for a party in January!